These Musical Planters Ring in the Sounds of the Southwest in my Garden. I have a new garden bed which has a South West Focal point as a seating area and I have carried the colors of turquoise and terra cotta through the garden with both accent pieces, planters and plants themselves. 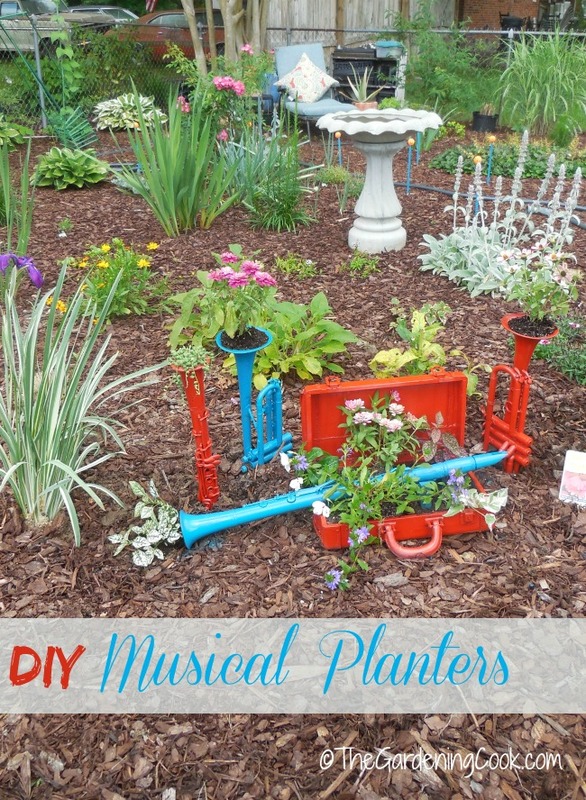 These musical planters are a whimsical way for me to ring in the sounds of the South West. I was a music major when I attended college and have always loved instrumental music. 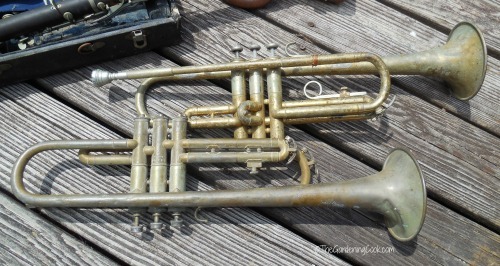 My husband loves bargains (as in free) and came home one day with a box full of dilapidated old musical instruments. He said “I think you can use them in your garden” with a big grin and happy look on his face. Since they are free (which I must admit I also love) and since they were nostalgic for me, I set about turning them in to some whimsical musical garden planters. 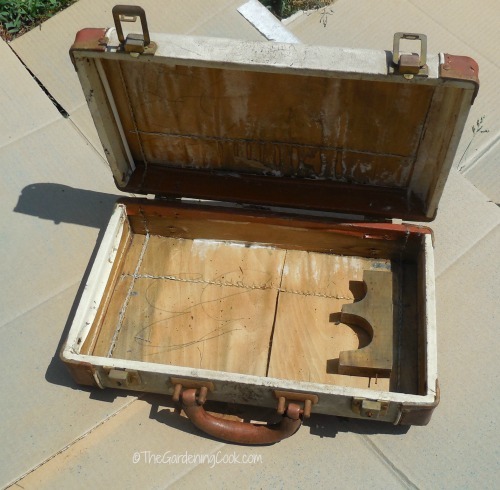 The instruments were in pretty bad shape, both for the instruments themselves and the cases they came in. Some real creativity was going to be needed to turn them into anything but an eyesore. There were two trumpets that I knew were large enough to hold at least a single plant with its soil. I will use them to give height to the musical setting. All they will need is a spray of color and they will do just fine. The clarinet was a bit harder to figure out what to do with. 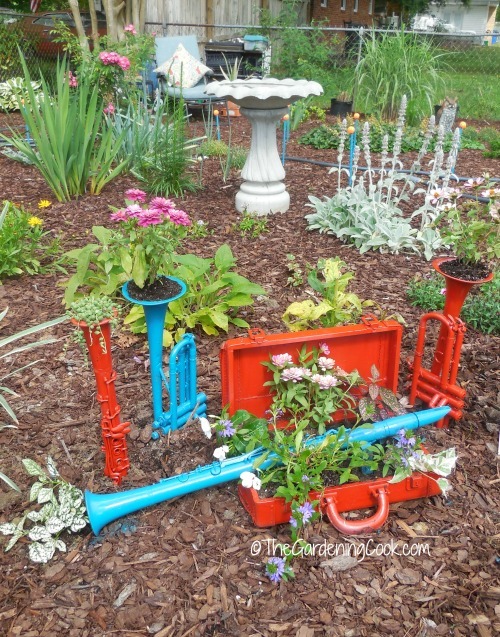 I had seen overturned planters with plants spilling out of them and wanted to incorporate this idea, but the clarinet was too long. The case it came in had really seen better days. 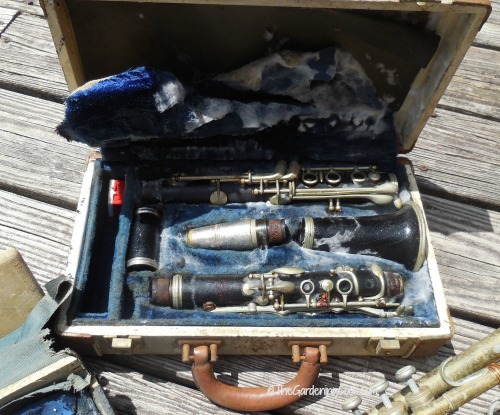 I decided to cut the clarinet down so it would fit into the larger case. The smell coming from the case was just an awful blend of mildew and mold. I stripped out all of the insert and saved just one prop of wood to hold the clarinet up. I had to let it dry out in the sun for 4 days before I could stand to be around it. 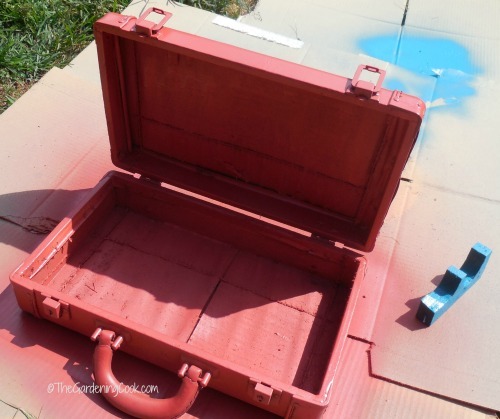 A coat of rust colored paint after it was dry made it into a somewhat manageable planter and base for my “spilling over” clarinet idea. I don’t expect it to last long but I should get a season out of it. The next step was a trip to the Farmer’s market. There is a lady there who has made it her mission to undercut every seller at the market and she had 3″ pots of annuals marked down to rock bottom prices. I got a whole tray of 10 plants for $10. You can’t beat that price. 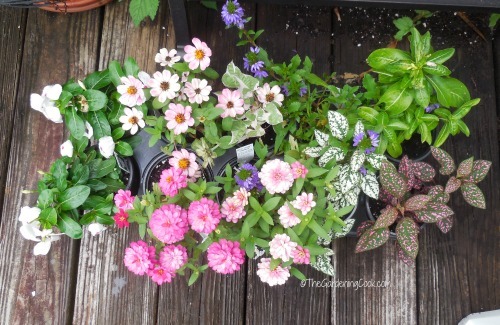 There are vincas, spotted polka dot plants and zinnias of all colors. Next came a coat of color for the trumpets and clarinet. I chose turquoise for the clarinet and the trumpets got painted both turquoise and the rust color. One small piece of the other clarinet gave me another tiny planter for a small succulent and it, too, got a blast of the turquoise. I stood them in two plant pots filled with wet soil to dry. Now that everything was painted and matched the colors I have chosen for my garden bed, it was time to plant and arrange them. 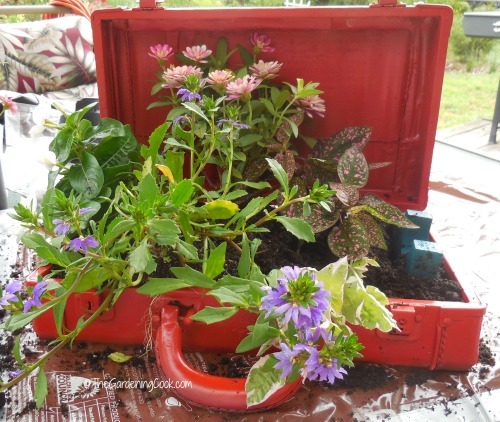 I added soil to the inside of the carry case, placed the piece of wood prop and laid the clarinet on its side with one tiny plant spilling out of it into the mulch. Flowering plants and small coleus plants that came from cuttings that I recently did filled out the case around the clarinet. 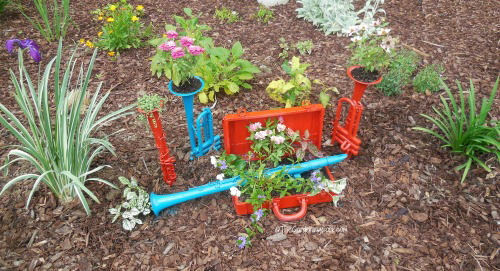 The trumpets got planted with colorful flowering plants and the extra clarinet has a string of pearls flowing out over the top of it. These were inserted into the ground with the mouthpieces in the dirt about 6 inches so only the top of the instruments show. I dug down into the earth and used a rubber mallet to push the instruments down and arranged it all for a cohesive look. 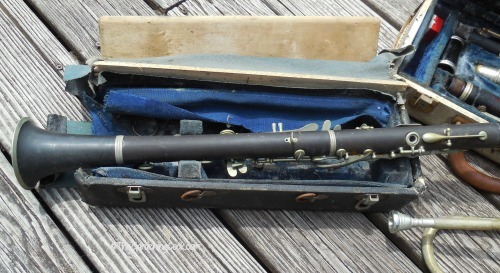 The long clarinet was placed in the carry case with some polka dot plant flowing out of the horn end. It will root into the ground and make it easier to water. The whimsical look of the planters is just perfect in my new garden bed. The colors tie in with all my other accent pieces and the hose guides I made earlier this week. It makes a great addition to my garden and makes me smile every time I walk by them. 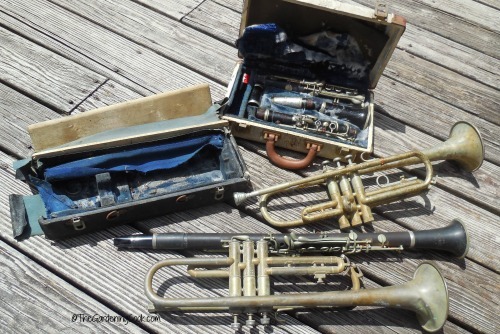 All together, this set of worn out musical instruments are ready to ring in the sounds of the Southwest. I love the look! What do you think of them? I love them! I know some people will maybe give you heck for ransacking the beautiful (!) instruments, but I say go for it!